Can the use of communication contribute to social change and transformation? In today’s current environment, the foundations of our system are constantly questioned and challenged. In response, a series of actions, which to date have had a fairly minor implementation in the developed world, are now emerging with a strong component of creativity and innovation. Perhaps most importantly, they possess a hidden potential to contribute to locally-owned reforms and sustainable change at various levels of society. We qualify it, therefore, as a bottom-up approach, which counterposes it to the top-down, meaning to start with the detailed design of the individual parts and afterwards link them to form larger components that will end up conforming a complete system. Strategies based on bottom-up information flows are potentially necessary, as they are based on the extensive knowledge of all variables that may affect the elements of the system. The growing emphasis on participatory and horizontal communication — such as stakeholder dialogue and bottom-up or consultation processes — have created spaces in which people can give meaning to and claim their citizenship. Such spaces allow people to not only be heard, but also to reshape limits and the social and/or cultural norms that shore up the given power relations. This in turn ends up contributing to empowerment and social change. Situations exemplifying this can be found all over the globe in very different contexts, even as it is still somewhat surprising to come across the application of similar methodologies in very different scenarios and backgrounds. 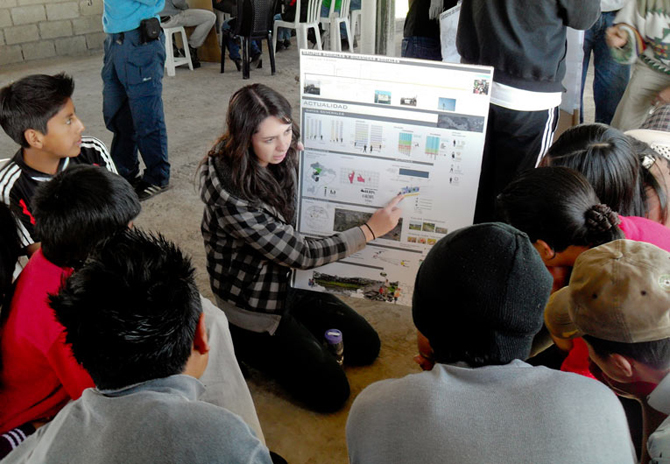 The common point is an extensive use of internet communication networks that enhance the implication and interaction that takes place among the members who end up constituting the projects: multidisciplinary teams formed by architects, neighbors, public institutions and other stakeholders involved in community planning. Architects have started to follow this type of participative methodology in order to define and propose consensus-based approaches, where communication becomes the key to involve people and get the project to make a real effect on the urban context where it is implemented. 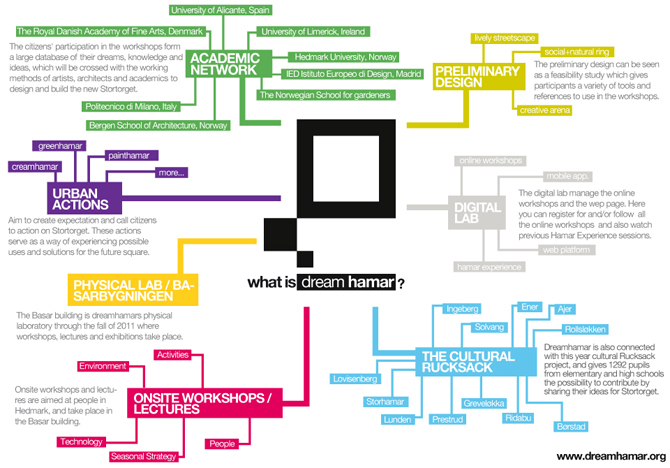 Not only were the Citizen of Hamar invited to participate on site in the process, but an online workshop was launched to enable people from all over the world to contribute to the design of the square. The two directors of the workshop defined themselves as ‘facilitators,’ in the sense that they designed a first approach to an existent frame where they chose very few rules to make the process understandable to all participants. After that, they proceeded to liberate the process, stepping back in order to let the participants go on without the influence of the workshop directors. When asked to describe their impressions on the process, Ethel and Paco usually compare it at the beginning to a blurred cloud of independent drops of ideas. 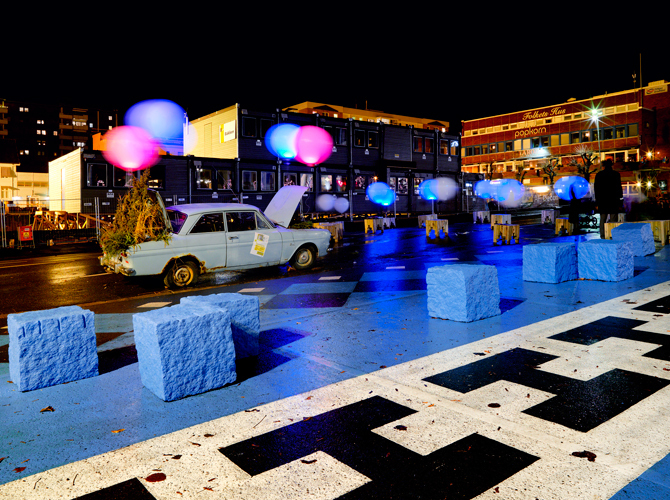 During the process, these apparently independent drops finally constituted a cloud that evolved with, and thanks to, the internal and external dynamics of the whole environment in order to become the soft rain that helps grow better actions for the Dreamhamar process at the Stortorget Square in Hamar. Naming it a TACTICAL URBANISM workshop wasn’t a random decision either. According to Michel de Certeau, strategies are location-driven while tactics involve calculations without their own space. Going further on, Certeau relates strategies to the defense of power, while tactics would come defined by power vacuums. According to him, the difference between strategy and tactics would lie in the type of operations enacted by each one and the role played by space as a sphere of action. Therefore, stating that strategies would serve more for top-down implementations, the use of tactics gives us space for a subtle, but much more persistent, manipulation of the public space. In fact, undertaking design, architecture and urbanism inevitably comes down to invention and tactical action, not just on a professional level, but also on a political level. 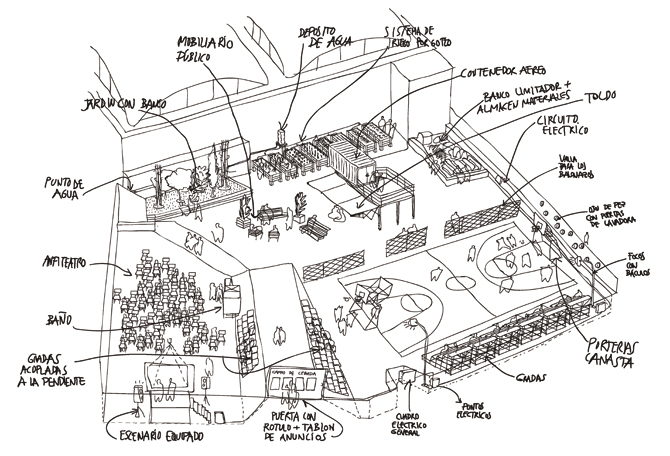 The door is open nowadays to new forms of design, where communication is the key element to involve the Citizen in urbanism projects. New tools coming from the internet such as social media or streaming enable what was not possible a few years ago, and as a result visions from different cultures can be mixed in to the same project. On the internet, we are witnessing an explosion of platforms where content and best practices with creative common rights are developed. As an example, Inteligencias Colectivas.org “draws its inspiration from this source in order to create a meeting point and a free database of collective construction details taken from real examples of non-standard intelligent constructions.” Communication and information become here both a right and a tool to widespread content and ideas that are free and shared, showing that form, content and channel start to become an indivisible pack. Communication develops into a mechanism of internationalization, indiscriminately free and reachable for everyone. Open communication is understood almost as a guarantee of equity and fairness, and a path the progress. Though, what does work at a worldwide scale can also easily find its counterpart at a local level. For instance, what the Ecuadorian team ‘Al Borde’ achieved with what started as a mere ‘taller particular’ ended up being a clear illustration of how communication is a powerful tool to promote visible change in distressed communities. 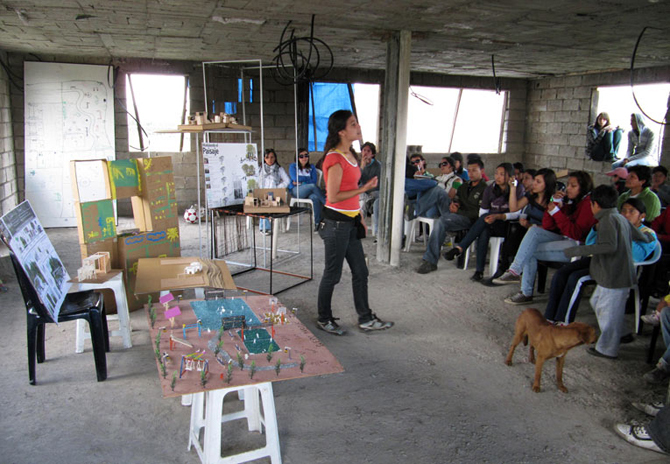 Organized together with the students from one university and the chosen community, under the direction of three professionals, one semester’s work focused on the intervention in the public space, to enhance the existing voids or problematic areas and convert them into real meeting points that could strengthen neighborhood organization. What really made them acknowledge that the project moved in a good direction was the fact that, during the break between semesters, the neighborhood took action and promoted its own many initiatives, ones still underway, such as community gardens, a soccer championship between nearby neighborhoods, and a program for young entrepreneurship. And in fact, that is the key of success for a project. Without the real involvement of the final user, projects that are implemented from top to down may end up being seen as forcefully imposed actions, away from the real needs of the population. It’s why a territory-based approach that engages all stakeholders has more chances to survive and be effective. Given this first huge achievement, the next step encompassed the construction of a real physical space that would allow the continuity of the started projects. 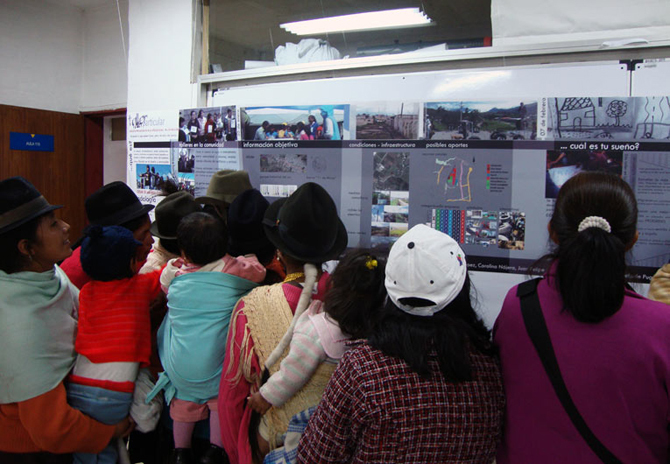 Soon they became so popular that they were awarded a Prize on Best Practices promoted by the municipality of Quito, that wanted to highlight both the projects done jointly with the students as well as their own pro-active dynamic that started in the neighborhood. But not only the neighborhood was enriched by this process. For the students, it also meant a switch in mentality, promoting a different way of understanding the profession and giving them the feeling of being active agents for change. This is perhaps one of the most important points. In a moment where the architectural profession is facing one of the worst crises in its history, where everyone discusses what has to be the new paradigm and the direction architecture has to move in, establishing the link between the people and the architect/urbanist gives reason and sense to a profession that will never be the same and is currently transforming into a tool of change itself. In Europe and, more specifically in Spain, where social claims reached an unexpected quota in 2011, we come across many examples of empowerment from these roots and self-management. The vacant lot “El Campo de la Cebada,” for instance, which translated means ‘the field of barley,’ is a collective formed by neighbors who decided to take a position on the degradation of this public space situated right in the city center of Madrid. After having defined common needs under the neighbors and seeking support, a process of negotiation with city hall started that permitted them to progressively develop the project. 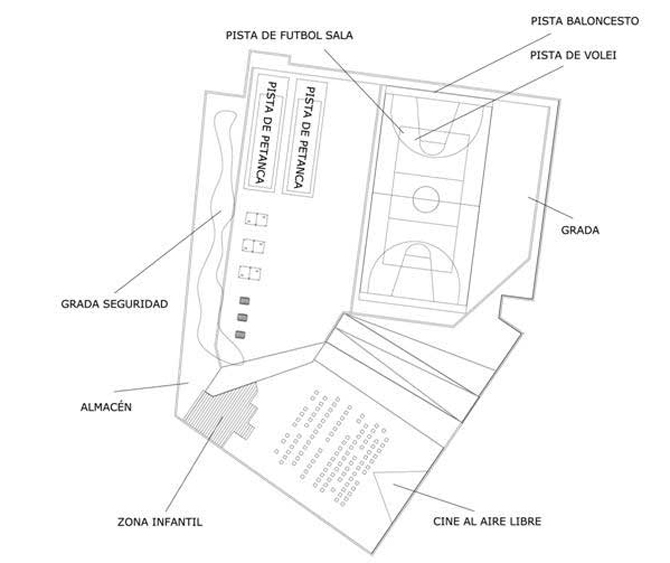 One of the first activities developed in this program was the creation of a communication network between the neighbors thought to facilitate their appropriation of the space and their involvement in the project. Depending on the demands and criteria of the neighbors, activities like urban farming, open-air cinema and sport fields were planned. 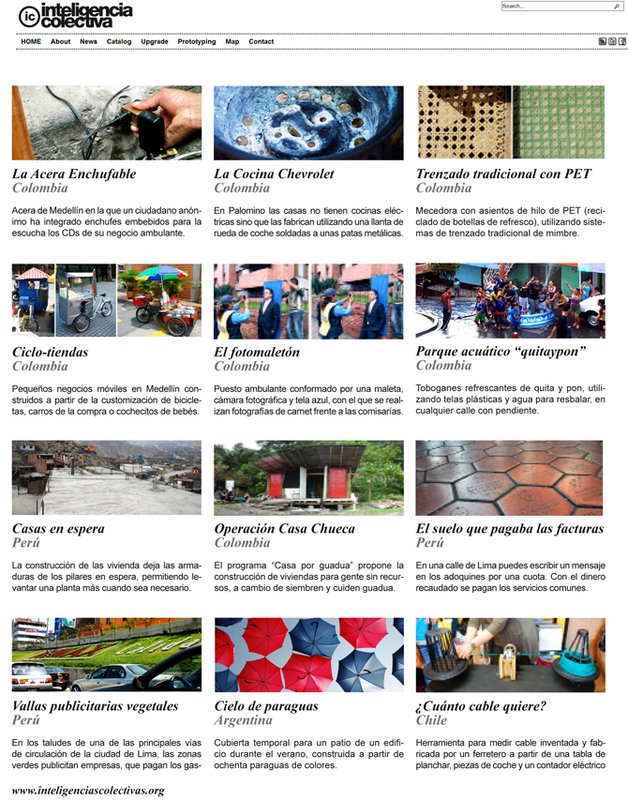 And not surprisingly, when looking at the people and stakeholders involved in the project, we come across architecture collectives such as Paisaje Transversal, PKMN, Zuloark, Basurama and Todo Por la Praxis, that entered to help design and build urban elements. Public space should originally reflect the wishes and desires of the society that creates it. It is the first field where action should not be imposed and where it is of crucial importance to take all opinions into account. The designer or the architect is to be seen as a way to channel the emotional needs of the user in order to translate them into a workable plan, as well as a technical aid to help the implementation of collective ideas arising from a common feeling of wanting to take action in front of the administration’s silence or negligence. The story of ‘El Campo de la Cebada’ is just one among several that have succeeded. 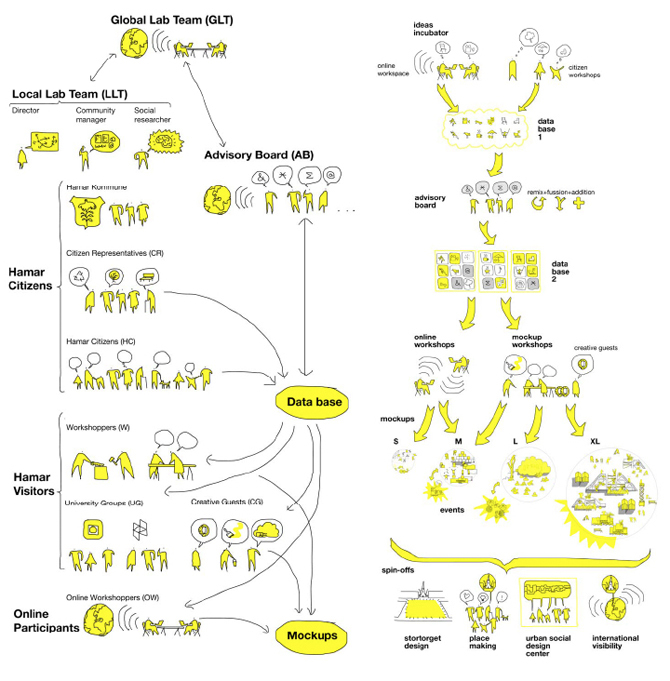 As a matter of fact, the highlighted projects follow working methodologies that don’t present anything radically new. Yona Friedman talked about similar approaches in the 70s, advocating for locally-found materials to be utilized in an architecture that was vernacular and simple in its choice of technologies used. He elevated the importance of mobility and variability while making a clear statement against the overbuilding trend that was undermining sustainability criteria, and in origin derived from a misinterpretation of architecture. The idea that architecture is not simply the art of building, but rather the art of managing space is now more relevant than ever. Hence, bottom-up initiatives with horizontal communication channels re-emerge strongly now, in an era that is in transition between analogical technologies and 2.0 platforms of bidirectional communication, bridging the gap between decision-makers and final users, while democratizing the process of design. 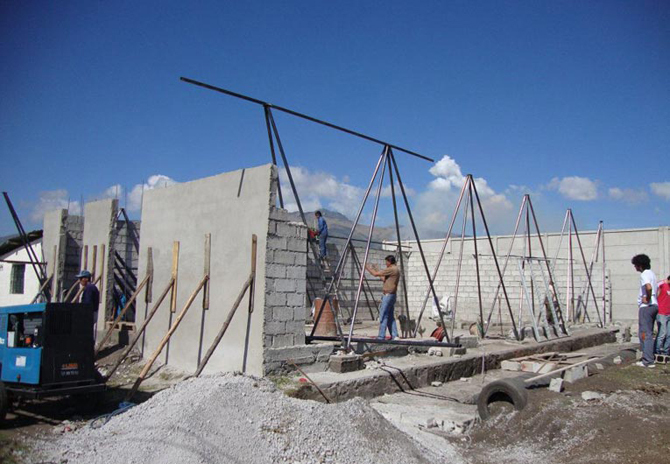 In a context like the current one, marked by a global economical crisis that is calling into question the foundations of our system, those proposals that incorporate solutions to the limitations of budget and promote shared construction methodologies and communitarian do-it-yourself approaches, find fertile soil to ingrain and take overhand. Bottom-up approaches, participatory systems, networking methodologies, pro common concepts and urban activations are terms that being already known, when used properly and incorporated in the work of designers, architects or the creative class in general, have as a result the architecture we like and that Yona Friedman called so aptly as architecture “with the people, by the people, for the people”. Eme3 was born in 1999 in response to the need to find spaces for architects, urbanists and creatives from different disciplines in which they could present innovative and unconventional projects that go beyond majoritarian trends in urban planning and construction. It was precisely the concept of volume, the unit of measure in cubic meters,that gave it the name and maintained it up to now.